The story starts back in 2007, in a small family basement buzzing with activity. The household was busy looking at sketches, reviewing swatches, while scraps of material were flying everywhere. In the early days, the basement of this suburban home was an epicenter of creativity and inspiration. David Cirjak, founder of The Shrunks, his wife and three children, drew inspiration from night rituals, monsters in the closet and noises in the night. A collection of vintage designs were born, that aspired to ward off things that go bump in the night. We all know that kids have vivid imaginations, especially when it comes to bedtime! What are they afraid of? From a simple question, an idea started to form, born out of the need to eliminate the fear of the dark and to make bedtime fun and safe for kids, wherever they are. Little did they know, that a small family business would grow from a little start-up to an international brand – inspiring confidence in children around the world. Beginning with a small line of on-the-go bedtime solutions for children, The Shrunks developed a line of distinctivly comfortable air-filled mattresses, which included the birth of the award-winning and original Toddler Travel Bed. Drawing on his experience as a product designer, David piggy-backed on the success of the mattress line and started to sketch up a range of clever solutions for everyday problems. Products for children with the familiarity of the home, to move and travel with kids wherever they went — whether they were camping outside, staying in a hotel room or just having a sleepover with friends. A range of products was created that was not only safe and portable, but influenced by European simplicity and retro chic designs from the 60’s. 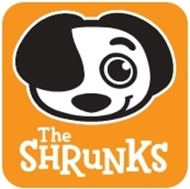 Whether children are headed to an adventure far away from home, or to a backyard fantasyland, the Shrunks’ goal is to inspire confidence - bringing fun and wildly imaginative products to children everywhere. Since their humble beginnings, The Shrunks have continued to establish themselves as a premium inflatable mattress company, dedicated to making products fun and safe for kids, wherever they are. Believing that clever products designed for small kids can make life easier for big kids (aka mom and dad), The Shrunks continue to develop products packed with a host of smart features, that can be easily packed and used just about anywhere. The Shrunks’ small packages can grow ten times their own size and then be easily stored away until the next adventure, into a small, neatly packaged travel bag. Going from small to BIG to small again – this is the lifecycle of a Shrunks product. Today, The Shrunks distribute their products to a diverse group of retailers ranging from local boutique shops to major international department stores all across the globe - throughout, the Americans, Japan to Australia, and even to the small country of Croatia. As the future continues to look ever so bright for The Shrunks, their core values remain unchanged. From that simple, early concept of making bedtime easier and more fun for kids, The Shrunks continue to turn big ideas into nifty little packages. It’s amazing how something that started out as a humble idea in a suburban home, grew to be a recognizable global brand, inspiring kids all over the world. Now, that’s pretty cool! In the past several years, The Shrunks have been recognized with various awards and accolades for innovations in both product and brand design. Here are some of them.